Now, the delay in posting this is not entirely my fault. OK, some of the delay is, just not all of it. 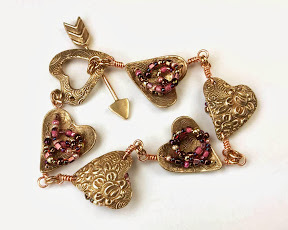 Most (but not all) years, members of the Western PA Metal Clay guild hold a holiday-season charm exchange. For some reason, it rarely gets agreed to very far in advance (which, of course, is why some years it just doesn’t happen…). In 2014, well into the fall, it was decided to not do it in December but, instead, skip that gathering (fair enough, it is a very busy time of year for everyone) and do the exchange in November. Aack! One of the things with the last minute planning is that we do let people exchange IOUs. That is, if you want to participate, but can’t get charms made in time, you can exchange an IOU that you’ll deliver your charms by our next meeting. Me, I find November easily as frantic a time as December and, though I made several attempts to block out a chunk of time for charm-making, each block kept getting eaten up by something else for which there was no escape. But I do enjoy the exchanges, so I jumped at the chance to use the IOU option. We typically exchange three (3) charms according to some rule or other. In the past, for example, we’ve put all the charms in a stocking and drawn pieces at random. This time, we changed the plan and did direct back-and-forth exchanges. The first photo shows the charms I received in the exchange. The bee in a circle, highlighted with gold colored guilder’s paste, was from Holly Dobkin. 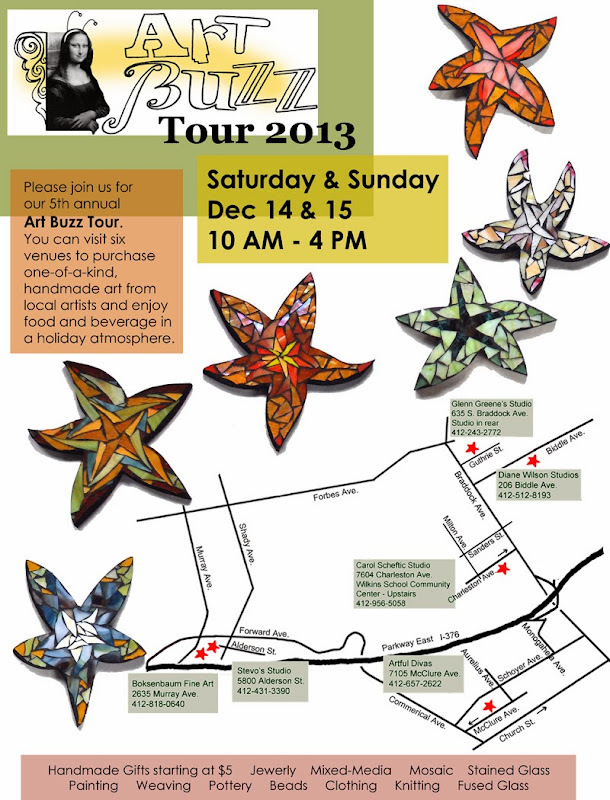 The puzzle piece, highlighted with Vintaj patina color, was from Debbie Rusonis. And the abstract circle, highlighted with a liver of sulphur (LOS) patina, was from Georgie Nix. I love the artistry of all three, in general, and was very happy to receive their 2014 ideas. Even though we typically exchange three charms, while I’m making mine I always add at least one and sometimes several more. This time, I tried to make five: three for the exchange, one for me to keep, and one extra for some time when having a little treat to offer would be useful. Except, somehow, I managed to crack one of the pieces while I was joining its two dried segments (I was so annoyed with myself: I even managed to crack both parts at once!) and it just did not seem worth the trouble to try to repair it. Instead, I reconstituted that clay and used it for something else later on. 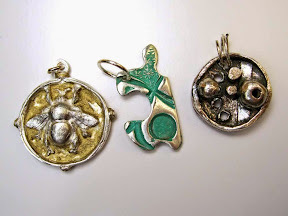 Regular readers of this blog will know that I love to make reversible pieces, and I do that even for little charms. For these, one side simply displays a deeply-textured pattern. I ended up being very happy I’d waited until December to even start these, because that permitted me to use the charms as my very first attempt at a variation on the Chip Inlay Project for the Holidays posted by Hadar Jacobson on December 3rd! 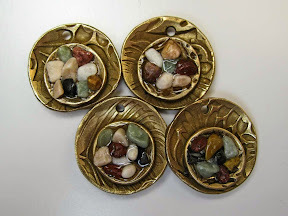 The final photos shows what I did on the “other” side of each charm: I made little cups that I could fill with something called “Painted Desert Sand” that I’d gotten a while back for a completely different reason. As my first attempt at this process, I’m definitely keeping the fourth charm, both as a reminder to myself and as a sample to use in discussions with other artists or students. I hope my guild-mates will let me know how these seem to hold up. I believe they’ll be fine, and I’ll be happy to replace any that appear to have any problems, but I’d sure rather learn about that from a sympathetic fellow artist than a possibly irritated customer. I’ve since used the technique on a few other pieces I’m testing out myself. Basic images of those, if not more detailed reports, will appear here eventually. (For now, I will say only that there are both similarities and differences among various fillers and holding agents…) I’ll say more once I’m confident in what I’m talking about with these, not just displaying untested guesses. For now, though, I just want to be sure folks know that making these sure is fun! Here’s another Champagne Bronze ring, this one topped by (hey, I just couldn’t resist it) a Champagne CZ. This one took a little while to tell me what it wanted to be…. It incorporates several of the other bits I said I’d try to write about another time in an earlier mention of shrinkage. The strip that I bent into this band didn’t shrink anywhere near as much as I’d expected, which caused me to re-think how I’d assemble it. The oval pieces on the top shrank about as much as I was expecting in length by width but, as far as I can tell, they shrank not at all in height. 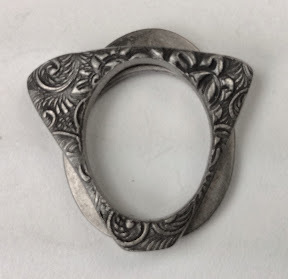 And that height matters in the re-design of this ring too: I’d thought I might make it so that they could spin (like the petals in my fine silver flower ring with ruby), but their thickness made that difficult. Yeah, I know ways around that, but this was just a supposedly-quick little trial piece, so I tried something else, to confirm how well they’d fuse in place. That did work out well and, again, I like the color (even though it still looks a bit more like sparking rose´ than champagne to me, though not quite as much as the first one I tried). I can of course make a bronze spinner later, when I can find time to do more accurate calculations on the shrinkage and actually plan it out. For now, I’ll just wear this one as-is, and quite happily, as a test of how rings made this way with this new product will hold up. 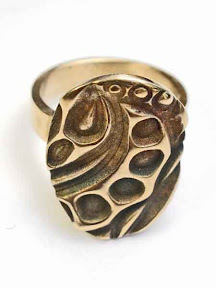 Which is probably all for the good anyway, as I’d’ve treated a spinner as a special-occasion ring, when having another nice Champagne Bronze ring for everyday wear is far more practical. Have you been wondering why, so far, all my posts about Hadar’s new One Fire Trio have mentioned shrinkage? 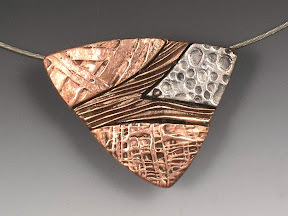 Every single metal clay piece of any sort will shrink during processing: as you let it dry (i.e., as the water evaporates), burn off the binder and, finally, sinter it. During each of those steps, things contract a bit. Exactly how much varies by product and technique, but it still happens. For many items, this either isn’t an issue (so what if a lentil bead comes out a tad smaller) or it can even be an advantage (for sculptural pieces, being able to work a bit bigger and have details end up magically smaller can be a real treat). But, for rings, where the band-size really does matter, then shrinkage matters. A lot. Which is why several of my recent posts have noted shrinkage among the various One Fire Trio products in particular. Even though I’m still puzzling over that, I have to tell you that there is one feature of Hadar’s new Champagne Bronze powdered metal clay product that I just love: with Champagne Bronze, I can bend ring shanks around a mandrel! 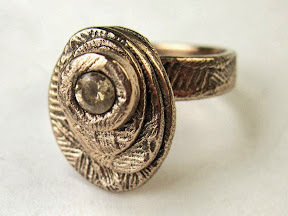 Years ago, working with fine silver, I figured out a way to make rings that I love (and that I later found out that some, but apparently not a high proportion of, others use and love too), a way that removes most of the shrinkage concerns. I make the strip that will become the band first. And fire it as a strip, so it shrinks. Then, I bend the fired-strip into the ring shape that I want, fiddle and adjust and tweak it so that it’s exactly what I want. I add any top-decoration to that, and refire the whole thing. The bit on top will shrink a bit, but if my estimate of that is off a fraction of a millimeter, it’s rarely noticeable. But the already-fired band should (if it was fired properly the first time) come out the same size it went in. To be sure, that approach does not work for every possible ring design but, for the ones where it does— Voila!—there are simply NO sizing issues. Before I wrap up my Smart Bronze test-reporting, I am inclined to take one last post to review and summarize a few of my thoughts about what I just put myself through. Over the last five posts, I outlined the eight firings I called “trials” to master the firing of this particular clay. If I were starting the whole thing today, I think I could hit the right numbers in a mere three trials. Yes, that’s more than one test-firing, but I do find that to be a very manageable number. (Yes, eight was too many!) Why do I say three? My first two firings were based on Hadar’s earliest information, right as this new product was released, before she had updated her Instruction Manual. Today, I would be starting with the later information, and avoid a couple of initial mis-steps with this new product. My last two firings were, really, my first two production firings. I counted them as tests mostly because, having encountered some earlier problems, I was being particularly cautious before declaring my testing done. Finally, the problems I had in one firing in the middle were simply because I’d spaced out and incorrectly programmed my kiln. Those did give me some more “confirmation” of what I thought had been going on but that should have been avoidable. That leaves me with the three firings I think I would have taken to get it right. And you should be able to hit it right in two or three yourself, because you will know the following…. The “Trick” to Smart Bronze. The conversion of all metal clays from a powder-form into a metal-structure one (oh, and regardless of whether they are precious metal (silver, gold) or non-precious (elemental copper or various bronze or steel alloy formulations)) requires that both (a) all the binder be burned off and, then, (b) the metal sinter and “soak” into a nice, densely-packed arrangement. In some cases, those can be done in one (sequential) process; in others, it requires two (separate) firing processes. “Smart Bronze” falls into the former category, which is its primary appeal over a number of other bronze formulations. Once you are sure you’ve adequately provided for the binder-burnout phase, only then can you confirm the actual goal-temperature that’s needed to allow sintering to take place. I know that our instinct, when sintering does not seen to happen as we’ve expected, is to try to adjust the final temperature or hold time with the expectations that such tweaking will solve the problem. But, until you get all that binder burned out, your metal will not sinter properly. You have to master the burnout-phase first. Every situation I have heard about where there has been a problem with Smart Bronze (at least so far) has involved inadequate sintering that, at least as far as I could tell, resulted from a problem in the initial heating up part of the process, when the binder should all be burning off. 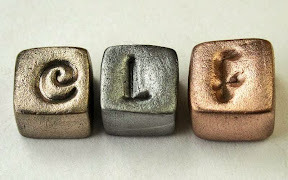 A Note on the Color of Sintered and Polished Smart Bronze. The two rings pictured with this post both contain large areas that have been polished smooth. The round, seamless ring has been completely polished. So has the band of the double-fire ring, as well as large, raised areas of its texture. In such cases, the metal polishes up to a bright, golden-yellow color. I’m not saying that either one of the colors — golden yellow or greenish bronze — looks better than the other. Just that they are rather different, and seem to be a result of the texture rather than any other construction, firing, or polishing approach that I’ve yet been able to determine. I have definitely begun planning pieces with one shade or the other in mind (e.g., with respect to some particular stone-color I may choose to add to a piece). I’d love to hear whether (or not!) 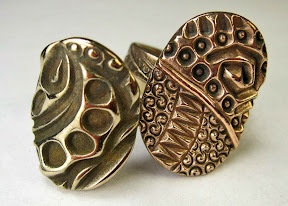 you find a similar pattern in the pieces you make out of Smart Bronze. Because, my readers, I sure am hoping you’ll try Smart Bronze too. Once you “get it,” it’s great. I’d love to hear how your results compare to mine! 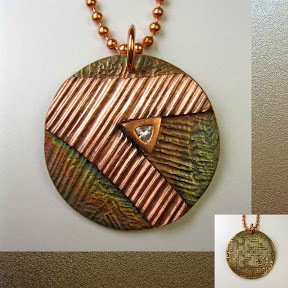 This post continues the story I’ve been telling about coming to understand Smart Bronze metal clay…. By now I was feeling time-pressure on top of some test-process frustration. What pressure? The various “test” pieces in Smart Bronze had not taken that much time to make, in and of themselves. But their firings had been eating up kiln-time. I was making and firing pieces in other metals in between so that I’d have enough inventory for the Three Rivers Arts Festival (held June 7 through 16 this year). Aside from the rings, which I’d been doing just for myself, I’d been thinking the “test” pieces might serve as the “loss leaders” in my collection at the Festival: an option for someone who really wanted something of mine but could not afford the higher-end pieces. (I’d make sure to cover my actual costs with them, but would take some loss on my time by just calling that testing-learning overhead.) And I write about all of this, now, as a teacher: to illustrate that even someone who, in general, does know what she’s doing … can also hit roadblocks, make mistakes, continue exploring, and figure things out. Just in time! Hadar (still) said: Ramp at 1400 per hour to 1430°F and hold for 2 hours. What I entered (correctly, this time! ): Ramp at 1350 to 1395 and hold for 2 hours. Test pieces: Taking a risk, I fired all of these: another open-ended ring shank, several botanic pendants and a collection of earring elements. All came out looking fine! Whew! Trial #8: Early June in a Brick Kiln. Or, have I moved beyond Trial Firings to Real Firings?! Hadar said: Ramp at 1400 per hour to 1430°F and hold for 2 hours. I entered: Ramp at 1350 to 1395 and hold for 2 hours. Test pieces: Once I’d attached a new “top design” to the ring shank from trial #7, I fired that in the kiln, along with another collection of little earring components. (Shown, here, are ten pieces I included in this particular load.) Once again, all came out looking fine. I could actually wear the ring! In the time since these last two “test” firings and my getting around to writing this report, I’ve sold almost all the earrings and pendants I stuffed into these test-loads. Success, at last! I’ll close this series with one final post, summing up what I’ve learned in the process. This post continues the story I’ve been trying to tell for the past two days…. Trial #6: End of May in a Brick Kiln, in which you will see how your tester spaced out momentarily…. Why had that last load’s wrap-ring broken: was there a weak spot, or was the firing program still not right? I didn’t want to risk breaking the seamless ring too, but I thought maybe I’d try firing it a second time just to be safe. I’d also made an open-ended ring “shank” for a double-fire ring that I could put into this load, as well as a couple other simple textured butterfly pendants I’d made up while the last load had been firing. And I’d nudge the hold-temperature up just a tiny bit while I was at it. Ramp at 1350 to 1395 and hold for 2 hours. Test pieces: Now, I had blistering. Just two little blisters on the open-ended shank (shown: first, right). 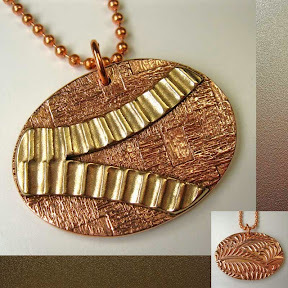 The textured pendants were bubbly all over. So was the seamless band (shown: second, left): it had had a “perfect” finish on it but, since I’d broken the other ring I’d fired with it, I’d stuck it in to see if a second firing would better-sinter it and now it looked a mess. Fixable, I hoped, but still … why?! What I meant to enter: Ramp at 1350 to 1395 and hold for 2 hours. What it seems I entered: Ramp at 1400 to 1400 and hold for 2 hours. Little differences can mean a lot! What can I learn from my observations, both before and after I realized my mistake? The textured pieces had bubbles that clearly did not belong to their textures. Ugly! But, though the rings both, at first, looked fix-able, I was even more disappointed by them! The seamless band had blistered, but I was able to work away at it (for a very long time!) with various sanding attachments on my rotary tool until I got it back to a nice condition. Not as pristine as it had been after its earlier polishing, but still very nice. And, it had shrunk another whole size (meaning it had gone down by a total of three ring sizes), which told me that the refiring had resulted in more sintering. At least that was a good sign. But the open-ended band, on the other hand, did not seen to have shrunk much, if at all; worse yet, it broke into three pieces when I slipped it (carefully!) onto my ring mandrel to check its size. Even though it looked at least reasonably well debindered, was it possible that the faster ramp had prevented all the binder from burning out? Or … what?! Of course, I’d made a mistake. It was just “little differences” here and all I needed to do was to go back to the pattern I’d been developing and it should work. I kept telling myself that. So, let’s take a little break here, to clear our heads…. This post continues the story I started telling yesterday, morning and evening…. By the time I got around to trying Smart Bronze again, a newer version of Hadar’s manual was out. Dated May 15, 2013, it told me that my goal in the first trial, 1420°F, was really only 10° below the (latest) recommendation, of 1430°F, whereas I’d intended to aim for 20° below Hadar’s recommended temperature. My second trial had still gone a bit too fast, yes, but it turns out that one really had been at my typical Hadar-clay adjustment of 20° less than the stated goal. That explained all the melting and left me a bit less worried, now, about whether I could get away with dropping my goal temperature some more as I also slowed the ramp speed. Hadar (by then) said: Ramp at 1400 per hour to 1430°F and hold for 2 hours; total firing should take 3 hours. I entered: Ramp at 1365 to 1400 and hold for 2 hours. This should have taken over 3 hours; the program completed in 2:58. Rationale for my new program: (1) Further slowing the ramp should continue to improve the binder burnoff. (2) This was still only 30° below Hadar’s newer target (hold) temperature. Test pieces: the last (and smallest) two “golden threads” loops that I’d made along with the ones “lost” in the first two trials. Results (shown, held up inside a slit in some green foam): Both test pieces seemed, at first, as though they might be debindered and sintered. But one small segment did break under very slight pressure (i.e., yes, the “threads” were thin, but this felt like a “normal wear” issue; I had not deliberately test-bent them but, instead, just lightly squeezed a wire-like bit with my fingers to get a good grip on it for polishing). It was hard to see the inside of the small ends. They seemed sintered, but perhaps not fully so. Still, this felt increasingly close to a program that should work. What to try next: Since there had been so much melting in the previous trial, at 1410, I was hesitant to blame any inadequate sintering on too low a firing (hold) temperature. Since any not-burned-off binder will inhibit sintering, I decided to maintain the temperature and try dropping the ramp-speed a bit more…. I entered: Ramp at 1350 to 1400 and hold for 2 hours. Results: Debindering seemed to have happened as needed. The pieces sintered into a nice, solid metal. A few small blisters appeared, but they were fairly easy to polish down. The results looked lovely but I have no pictures: sorry! The reason for that is great: As I was finishing their polishing and stringing them up to photograph, a delightful fellow walked into my studio looking for a gift for his twin daughters and bought them both! Hadar (by then) said: Ramp at 1400 per hour to 1430°F and hold for 2 hours. I entered: Ramp at 1350 to 1390 and hold for 2 hours. Test pieces: I was ready to go for it! I’d had several ring bands ready for weeks! One was made using the “seamless” ring approach; the other was made as a bypass or wrap-ring although I did “connect” the edges of the two ends as they passed each other. I did the latter because I wanted to help keep the piece a bit more stable than it would have been had I left it with “loose” ends. Results: Both seemed to debinder and sinter beautifully. My only concern was that they had not shrunk by the predicted 2.5 sizes. I was seeing them as not quite 2 sizes smaller. Was that enough? Had I dropped the temperature a little too much? Maybe. Maybe not. But I was hopeful. 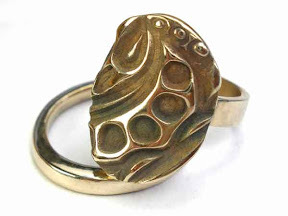 I first polished the wrap-ring, which looked gorgeous, so I wore that happily while I worked on the seamless ring. When I left my studio at the end of the day, the seamless ring was sitting there waiting to be photographed with its kiln-mate. (It’s shown, here, alone.) I wore the wrap-ring home. The next two days had me moving some furniture and packing-boxes from a recent home improvement project, along with other normal daily activities. I continued to wear the wrap-ring and, half-way through the second day, it suddenly broke into three pieces. Admittedly, the wrap-ring design did have one “thin” spot. The band was an even thickness all around (which you can see from its greenware-state photo (brown color) above), but it been cut in a tapered shape, so it had the least “height” right where it met the large starting-edge. Which could have been a point of weakness. Which could have explained its breaking open. Or, maybe even breaking into two pieces. But its breaking into three pieces hinted to me that there was another problem somewhere. Less obvious, of course, was the exact nature of that problem. Should I worry about the pendants I’d just sold? I think not. They were thinner, and less likely than a ring to get knocked around a lot. Still, there was another pause in my testing so I could think this through some more: and another point at which I’ll pause this record too. This post continues the story I started this morning, reporting activities from last month…. Hadar (back at that time) said: Ramp at 1400 to goal-temp of 1440 and hold for 2 hours. I entered: Ramp at 1400 to goal-temp of 1420 and hold for 2 hours. This should have taken just over 3 hours; the program completed in 2:42. 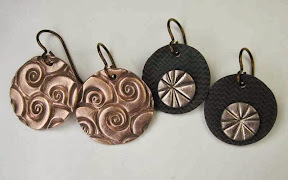 Test pieces: one small stamped disk and one “golden threads” loop (the latter was a simple project from Hadar’s blog when she introduced the product she calls Brilliant Bronze). Results: Two test pieces were simultaneously under- and over-fired! That is they were under-fired in relation to the debindering phase, and over-fired in relation to the sintering phase. How did I know this? What I found were small, uneven blobs of bronze (i.e., over-fired at the end) that, when handled and examined, disintegrated into small bits of metal and dust (i.e., under-fired at first). The firing finished late at night and I was tired and a bit frustrated: I tossed them before thinking to try to take a photograph. What to try next: Even though this material can be fired in just one round, the conditions still have to be right for both (1) debindering and (2) sintering to happen as desired during the (1) ramp and (2) hold phases, respectively. Clearly, this kiln-program was not the right one on either count. I’d have to adjust it in several ways. Hadar (still, back then, though later revised) said: Ramp at 1400 to 1440 and hold for 2 hours. I entered: Ramp at 1375 to 1410 and hold for 2 hours. This should have taken over 3 hours; the program completed in 2:45. Rationale for my new program: (1) I was hoping the slower ramp would allow for better binder burnoff. (2) Since Hadar’s other clays all worked great for me at 20° less than her posted temperature, I wasn’t yet ready to go plunging further than 30° below her number. Results (shown): Both test pieces seemed, at first, to be a bit better debindered and sintered than the previous trial. They did show some signs of melting, but nothing like the last time. Still, they broke under very light pressure while holding them to photograph them. It was hard to see the inside of the small ends. They might have been somewhat sintered, but certainly not fully so. Still, this felt like some (if small) progress from the first mess. At that point, I took some time off from this testing, and will pause my report here. Before I close this post, however, I’ll add one other thought. A Comment on the Name: Smart Bronze. As a customer, who is buying this product to use myself, the name almost makes some sense. First of all, unlike many other base-metal clay products (from Hadar and others), it should be possible to process this one in a single (reduced oxygen) firing. Many of the others require two firings of one sort or another, but this product was developed to be “smart” enough to both debinder and sinter all in one go. Which is very convenient! Also, it does polish up to a lovely color, a color that one might call “very smart”…. 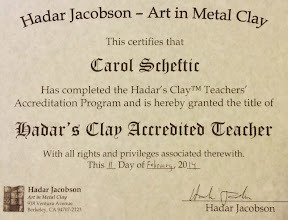 (And, for anyone familiar with Hadar’s Clays, a curious pun in comparison to her Brilliant Bronze.) But, as a maker, I do find it an awkward name. It’s not one I would want to use on the label of a piece I made using it. More on this in a later post (most likely after I’ve finished this whole series on testing). Because that’s it for right now. But I’ll be back as soon as I can with more info. The newest Hadar’s Metal Clay Powder product is called Smart Bronze. I spent over a month playing around with it, and I think I finally figured out some things about it. (Not everything, mind you, but at last I feel well on my way!) After then spending a few weeks catching up on a several other urgent tasks, I’m hoping I can finally find time to post here a collection of thoughts and experiences. OK, it’s not like a spent a solid month and more figuring this out. The time I spent did cover most of May, slipping into early June, but it was in dribs and drabs. To begin with, I am not a full-time jewelry artist! I do learn, explore, make, sell, write, and teach about it. Some weeks, it does end up being just about all I do. But there are other stretches when I don’t touch the stuff at all. Most of the time it’s somewhere in between those extremes. Averaging out over a whole year, I figure that I do this about quarter-time, or maybe a third (depending on how you count both “this” stuff and “full” time…), but only that. Whatever the actual proportion, it’s a delightful fraction, I must say! But more than that would feel like work and, though I am trying to treat it all in a very professional way, I also really want to keep this for fun. My point is that the fun I had figuring out Smart Bronze was a very part-time part of that part-time activity: though I’ll drag the description out for several posts, in reality it all went rather quickly. Also, I have two kilns, in two different styles: one firebrick, and one ceramic muffle. So far, I’ve done all my Smart Bronze testing in the firebrick kiln. When I find some more drib-drab time, I’ll try it out in the muffle kiln too. But if you are reading this in the hope of learning from my experience before firing the stuff yourself, it may help you to know that both my kilns have inside dimensions of about 8 by 8 by 6 inches. The firebrick one can reach 2350°F; the muffle, 2000°F. Smart Bronze fires well below both those limits. 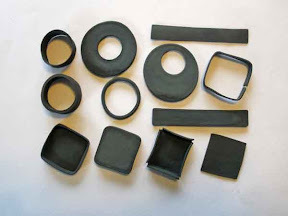 To fire base metal powder clay in my firebrick kiln, I most often use a box I’ve folded myself out of stainless steel tool wrap (e.g., the No Flake Foil sold by CoolTools), and the carbon that Hadar Jacobson recommends in her Instruction Manual (coconut shell-based, acid-washed, size 12×40). With that particular combination of kiln + box + carbon, for the majority of Hadar’s clays, through testing I have found that the ramp-speed she suggests works fine, but I should lower the goal-temperature by about 20°F from what she recommends to get full sintering without blistering or other signs of over-firing. (It could just be a difference in our kilns, but another factor could be that my lightweight foil boxes transmit the heat a little better than the heavier stainless steel bowls I think she uses?) I might do a little more adjusting for smaller containers or much fuller loads, but for what I was firing in these trials, I started out thinking that a drop of 20° should be the only adjustment I’d need. Finally, whenever I first try any new clay, I always do at least one “test” firing first. I know that some artists plunge right in to make a new masterpiece and just fire it, but I can’t bring myself to risk something like that until I feel really certain I’ve mastered enough of the relevant firing details. At the other extreme, some people will just roll out a plain slab of clay about the same size and thickness as their intended masterpiece, and test-fire that. While much safer, I can’t quite bring myself to simply “waste” a good chunk of metal (even if it’s not a precious metal) that way, not to mention the firing -time and –energy. I have found, instead, a middle ground that works for me: I make several very simple pieces. If they fail, I’ve lost a few more minutes of my time than I would have if I’d just fired a plain slab. But I want to believe that the firing will work and, when it does, then I will have a simple little piece that I can sell inexpensively or give as a small token-style gift (instead of just a piece of “waste” material). I found the working properties of this product to be comparable to other Hadar’s Metal Clay powders. That is, it is easy to mix into a clay form. It’s easy to work with. It has a very nice feel to it. None of Hadar’s clays are sticky, like some metal clays tend to be. 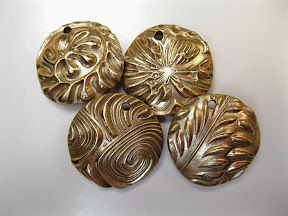 (Yes, you do want to use a bit of olive oil between them and any textures, stamps or cutters you press into moist clay, but it’s not like you have to work in a complete cloud of release agents to keep it from sticking to everything!) Smart Bronze has a very good working time, and it’s easy to rehydrate if you work more slowly. It dries to a very hard state, which makes it easy to clean up and polish pre-fire (which is a feature I really appreciate). Ah, but now, this is where the real testing comes in. Brick kiln: Ramp at 1400°F/778°C per hour to 1440°F/782°C. Hold 2 hours. Muffle kiln: Ramp at 1400°/778°C per hour to 1495°F/810°C. Hold 2 hours. Brick kiln: Ramp at 1400°F/778°C per hour to 1430°F/776°C. Hold 2 hours. Muffle kiln: Ramp at 1400°F/778°C per hour to 1470°F/799°C. Hold 2 hours. Pieces thicker then 10 cards or mixed with other metals should be pre-fired.